"Chicken, bacon, mozzarella, mushrooms, and creamy Alfredo sauce are all inside a warm, crunchy quesadilla! Fun and easy to make. Impressively great flavor! Try these tonight!" Heat olive oil in a large skillet over medium heat. Cook and stir chicken in the hot oil until chicken is fully cooked and no longer pink in the center, 8 to 10 minutes. Remove chicken from skillet and set aside. Pour out any excess grease from the pan. Cook and stir bacon and mushrooms in the same skillet over medium heat until mushrooms are lightly browned, about 5 minutes. Reduce heat to low. Slice chicken into bite-size strips. Stir Alfredo sauce and chicken strips into mushroom mixture; simmer for a few minutes. Melt butter in a separate large skillet. Place a tortilla in the melted butter. Scoop about 1/5 chicken alfredo mixture onto 1 half of warm tortilla. Sprinkle about 1/5 mozzarella cheese over chicken alfredo mixture layer; fold tortilla in half. Cook until bottom of tortilla is lightly browned and mozzarella is melted, 3 to 5 minutes. Carefully flip quesadilla with a spatula and lightly brown the other side of tortilla, 3 to 5 minutes. Repeat with remaining tortillas and filling. Slice quesadillas into thirds to serve. we had it last night & it was awesome!! we love quesdillas & it kind of tasted like a chicken bacon ranch flavor!! flavors matched wonderfully!! Just finished serving this scrumptious quesadilla! This is very yummy!!! 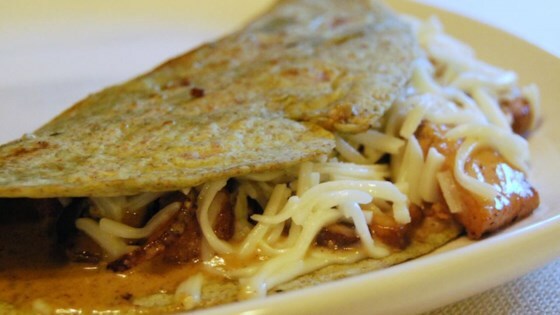 This is by far my favorite quesadilla recipe ever!